But what are harmonious colors? 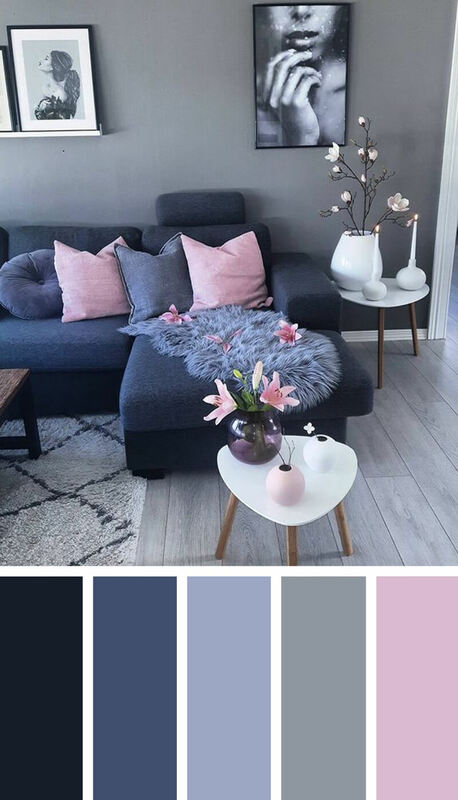 They can be different tones and shades of the same color, known as a monochromatic color scheme. Many people think that only black, gray, and white are monochromatics, but in truth, any color can be used in a monochromatic color palette. Analogous color is another type of harmonious color combination. These are colors which are next to each other on the color wheel. Some examples are blue and green, red and orange, and purple and blue. Curl up with a steaming cup of coffee or tea and a novel in this soothing contemporary family room. 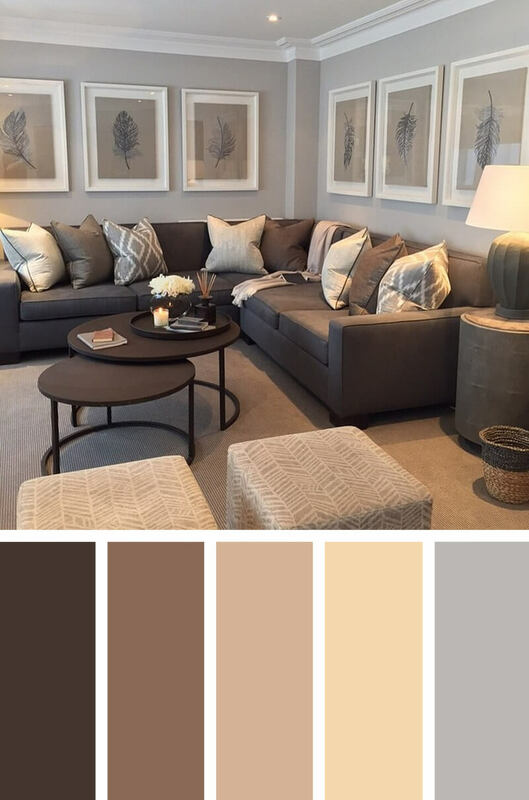 The palette is composed of cool neutrals—monochromatic browns, cream, and gray. The rich brown sectional sofa is accented with cream and gray-patterned throw pillows. A plush tan carpet warms up the floor. Light gray wall paint pulls the coordinating gray elements from the patterned pillows and lends a calming influence. 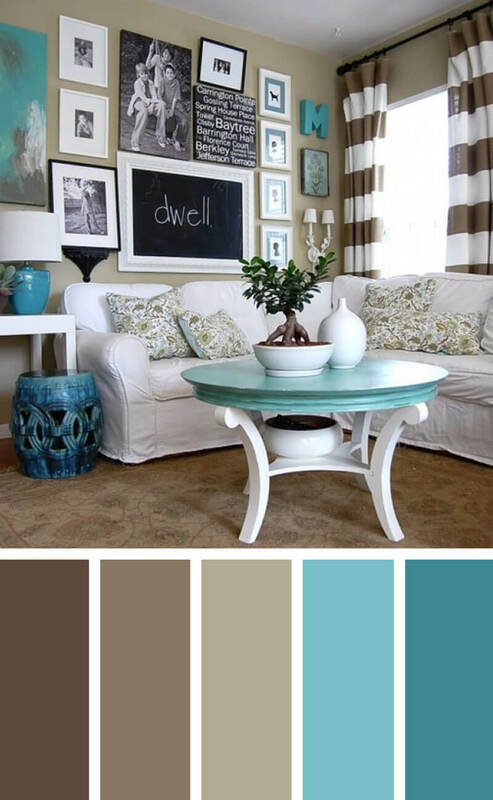 This cheerful living room uses a bold palette of brown, turquoise, and white, recalling the earth and sky. Lighter monochromatic tones of brown and turquoise create a sense of harmony. 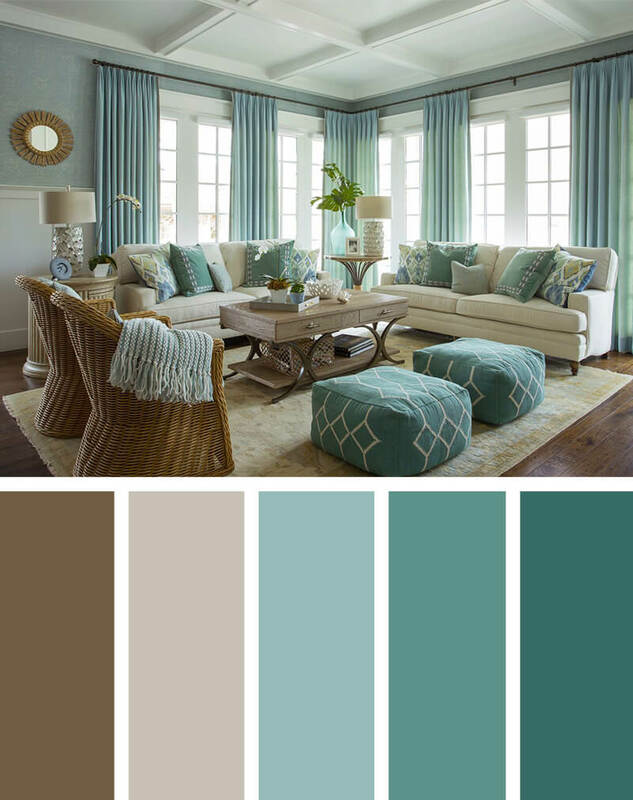 Different shades of brown on the walls and floor provide a relaxing warmth, while the turquoise accessories and striped curtains give the room a pop of color and drama. The slipcovered white couch is casual and comfortable, adding balance. A sanctuary from bustling city life, this urban living area is a perfect example of how monochromatic colors bring harmony to a room. 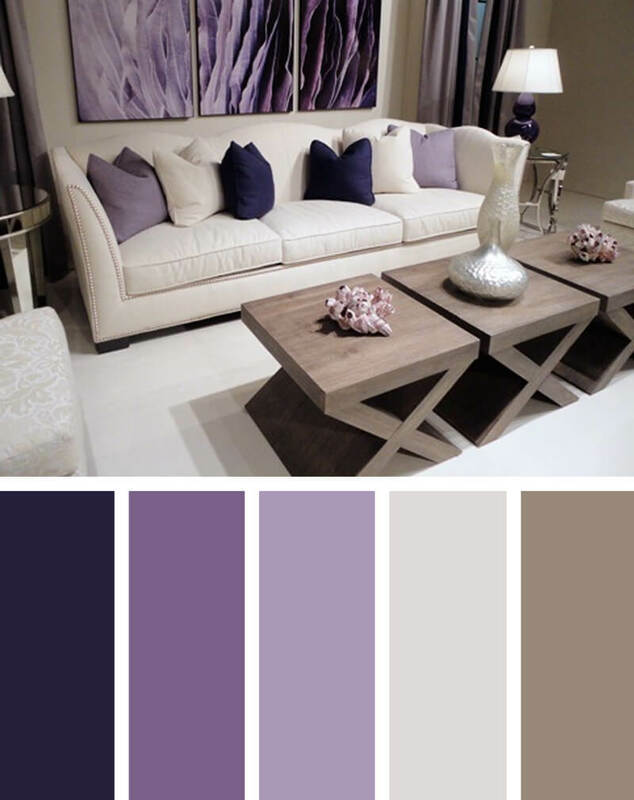 The color palette is very simple: an ivory carpet and couch, taupe tables and walls, and purple accessories. However, the three different shades of purple shown in the throw pillows, art, drapes, and lamps “finish” the room, turning it into a more complex and harmonious space. Pale shades of blue, linen, and white grace this living room in an elegant tribute to Old Hollywood. The secret to Old Hollywood style is in the luxurious details: tufted furniture with nail head trim, velvet pillows, mirrored end tables, a white shag rug, and metallic accents. But how to keep a pale living room from feeling too chilly and formal? Warm it up with a rich espresso floor and fawn walls. Enjoy rich autumn colors all year round! Deep orange and gold are analogous colors, or colors that harmonize because they are next to each other on the color wheel. To increase the feeling of harmony, two monochromatic shades of orange and orange/brown are included in the pillows and rug. 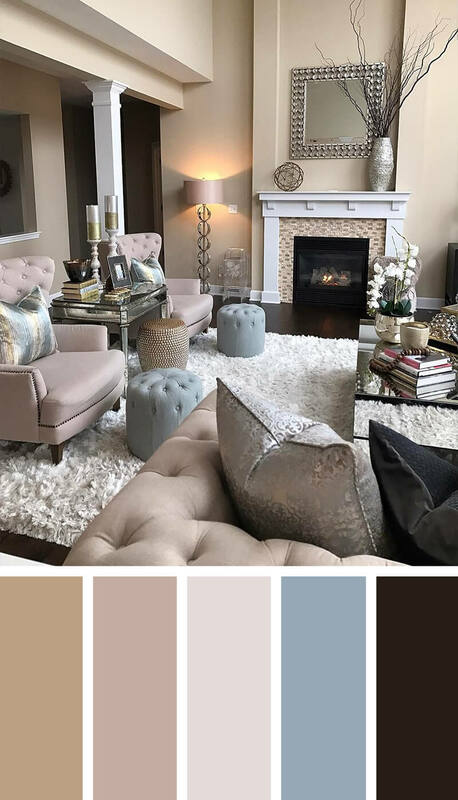 A sofa and love seat in a neutral tan give the eyes a break from the strong saturated colors, adding balance to the room. There are few color combinations more elegant and serene than celadon and espresso. 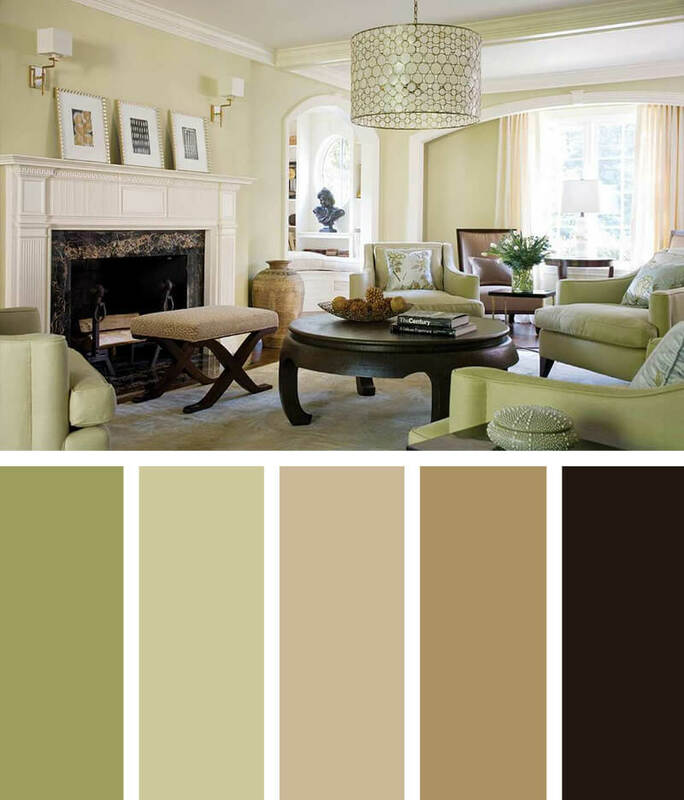 In this living room, the monochromatic tones of both colors instill a gentle yet stimulating energy. The celadon chairs and light celadon walls contrast delightfully with the espresso coffee table. A neutral beige carpet grounds the room, while floral satin pillows add visual interest. A variegated brown vase and side chair lend an earthy vibe. 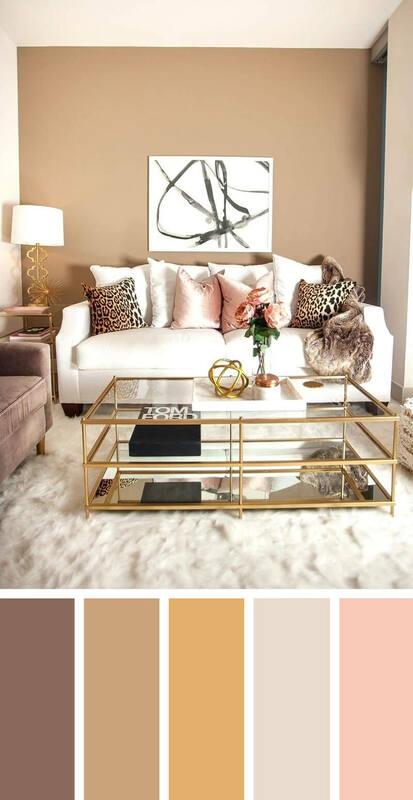 This deliciously sophisticated living room is done up in Neapolitan ice cream colors of chocolate, vanilla, and strawberry. The tones of chocolate and beige on the walls add a sense of coziness; pink pillows and a gold table and lamp bring glamour to the room. The leopard print pillows are actually considered neutrals, which will complement almost any color scheme. A stark black and white painting lends an edgy contrast. Intimate. Hopeful. Serene. These words come to mind when you see this living room. The walls, floor, and rug are soothing shades of gray and the couch is a deep twilight blue, accented by a lighter-toned fur throw. Pink throw pillows and flowers break up the grays and blues so that they do not overwhelm. Gleaming white side tables add a focal point. Black and white photographs pepper the walls with personality. Sandy tones of light beige make this beachy living room exude comfort. 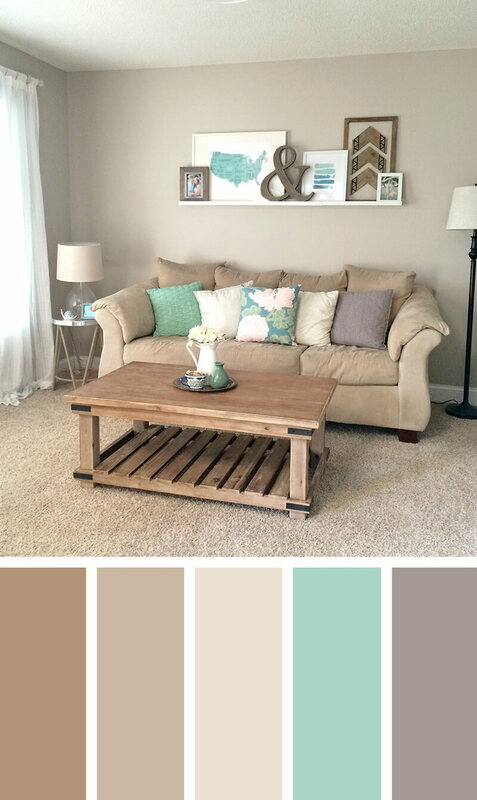 Notice how the carpet, walls, couch, and coffee table are all tones of the same color, creating a soft harmony. Contrasting sea green and white elements are added in the form of throw pillows and wall art set upon a decorative ledge. A gray pillow and picture frame lend a soothing calm to the room. Warm and welcoming, this monochromatic gold-toned room invites guests to sit for a spell and enjoy some good old-fashioned conversation. The lightest gold tone is on the walls, giving the room an open and airy feel. The striped rug incorporates several gold tones of caramel, topaz, and wheat, pulling the room together. Two plush chairs in espresso brown, a warm neutral, anchor the room and keep the gold tones from being monotonous. This living room feels like an extended summer vacation: the range of harmonious tonal blues on the walls, curtains, and couch are refreshing and relaxing. The neutral linen shades of the rug, table, and couches go with the flow and provide a soft backdrop to the blues. Golden wicker chairs and an accent mirror warm up the tranquil colors and keep them from becoming overwhelming.